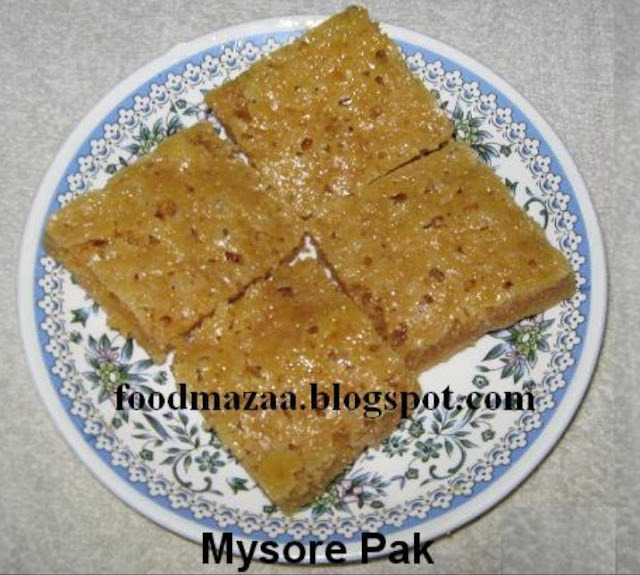 The Mysore Pak was incidentally the best sweet to come out of our efforts.I was so apprehensive of the result that I did not take too many photos while making the recipe.But I will try to explain it as clearly as possible. 1. Melt ghee & keep aside. 2. Heat 1 tbsp ghee (from the given qty) in a pan and roast besan in sim until raw smell goes away. Do not let it turn even light brown. It has to be the same color, only the smell goes away. 4. Take sugar in the pan, add the water & boil until the consistency is of a thick 1-thread. 5. Add 1 tbsp ghee to it. Mix well. 6. Add 1 tbsp besan & see the froth coming up. 7. Add the entire qty of ghee now, mix well. 8. Add the entire qty of besan also, and mix both until everything is mixed up evenly and the mixture starts thickening visibly with bubbles. IMMEDIATELY TRANSFER THE CONTENTS INTO A GREASED THALI. After it sets, you may cut it into cubes and serve. The color keeps darkening even after transfering into thali. Thats y we musn't brown the besan while roasting. The trick is to make sure that once it expands, it doesnt go down again. The other methods that tell u to add spoon-by-spoon of besan & ghee actually kill the whole purpose.The expansion has to be only once.As soon as it comes to its full height, its supposed to go onto the plate. So all the best with this version of Mysore Pak!! Wow punam mysorepak looks fabulous...ur method of making mysorepak seems very easy..;sure will give a try...am drooling now here...Happy Diwali to u n ur family..
Yeah, please let me know the result too. Okay?